The prospect of life on other planets has always petrified me. Whereas others are excited by the idea of cute little green men coming down to visit us and healing all our ills and issues all I think about is evil aliens with extremely advanced technology wiping out the human race. That and probing, lots and lots of probing! It seems that the horror world agrees with me and there have been some fantastic space man horror movies from Fire in the Sky to Dark Skies, from Grabbers to Attack the Block and from Lifeforce to every version of Invasion of the Body Snatchers all putting forward the idea that when extraterrestrial’s come it will most definitely not be in peace it will be for our pieces! 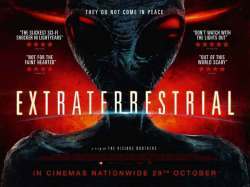 From the guys behind Grave Encounters, The Vicious Brothers have very much the same idea and their movie Extraterrestrial is a gory and great horror that not only plays on all the alien conventions we have grown to expect but throws in all manner of new ideas along the way and best of all its out of this world scary. Opening with a shocking abduction that puts a horror twist on “E.T phone home” the movie moves to more familiar territory as we are introduced to April (Brittany Allen) who believing she will be having a romantic weekend away with just her boyfriend Kyle (Harry Potter star Freddie Stroma) in a cabin in the woods owned by her family discovers he has invited some friends to party with them. Heading for the same secluded location where the police, lead by Sheriff Murphy (House at the End of the Street’s Gil Bellows) are investigating multiple disappearances all seems normal for the foursome as they party hard and have fun. The frivolities stop however when they see a strange light in the sky which crashes into the forest nearby. Heading to see what it is they discover a real life UFO and more disturbingly a set of odd looking foot prints leading straight back to where they just came from. With no one to turn to April seeks advice from the only source who seems to be able to help, conspiracy nut job Travis (the amazing Michael Ironside) whose crazed theories are becoming a reality right before his very eyes. Plunging you straight in like the equally excellent alien horror Altered, Extraterrestrial is a brilliant blend of slasher movie motifs and Sci-Horror elements all rolled up in a cracking story that puts some interesting twists on what has been seen before. With some U Fing O my god set pieces and genuinely spooky scenes the effects are very well done with the Greys kept in the dark for much of the movie and only revealed fully towards the end where the film takes an inspired trip off world and inside the alien ship for the chaotic climax. The cast are all solid with a real stand out performance from Michael Ironside as the secret theory spouting pot growing Vietnam Vet with far more answers and fire power than you would have thought offering up a great character twist on the usual medical or psychological expert found in more mundane horror movies. Fear probing fun with plenty of frights, great action and truly unsettling moments Extraterrestrial is a creepy close encounter that abducts your anxieties about aliens from the start and doesn’t let go. 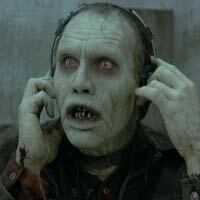 THIS HALLOWEEN STUDIOCANAL CHALLENGE HORROR FANS’ KNOWLEDGE!